The Bjerknes Centre is a collaboration on climate research, between the University of Bergen, NORCE, the Institute of Marine Research, Nansen Environmental and Remote Sensing Centre. Low growth in global carbon emissions continue for third successive year. Global carbon emissions from burning fossil fuels did not grow in 2015 and are projected to rise only slightly in 2016, marking three years of almost no growth, according to researchers at the University of East Anglia (UEA) and the Global Carbon Project. The projected rise of only 0.2% for 2016 marks a clear break from the rapid emissions growth of 2.3% per year of the previous decade. The new data is published in the journal Earth System Science Data. It shows emissions growth remained below 1 per cent despite a strong global economy with GDP growth exceeding 3 per cent. Decreased use of coal in China is the main reason behind the 3-year slowdown. 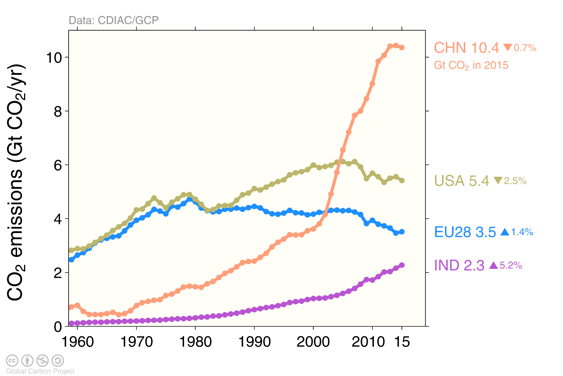 China – the biggest emitter of CO2 at 29 per cent – saw emissions reduce by 0.7 per cent in 2015, compared to growth of more than 5 percent per year the previous decade. A further reduction of 0.5 per cent is projected for 2016. 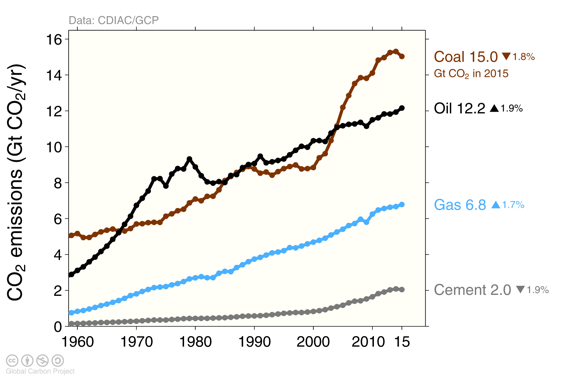 The USA, the second biggest emitter of CO2 at 15 per cent, also reduced its coal use while increasing its oil and gas consumption and saw emissions decrease 2.6 per cent last year. 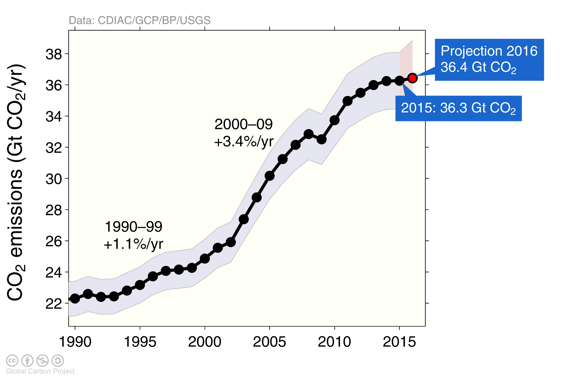 USA emissions are projected to decrease by 1.7 per cent in 2016. The EU’s 28 member states follow the USA as the third largest emitter causing 10 per cent of emissions, and India contributed 6.3 per cent of all global CO2 emissions. 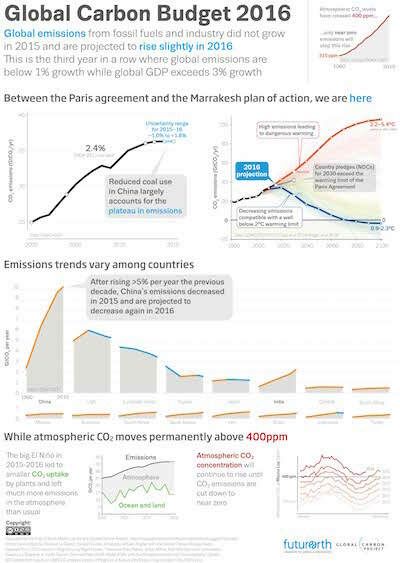 The break in emissions rise is aligned with the pledges by countries to reduce emissions until 2030, but it falls short of the reductions needed to limit climate change to below 2 degrees Celsius. The Global Carbon Budget analysis also shows that, in spite of a lack of growth in emissions, the growth in atmospheric CO2 concentration was a record-high in 2015, and could be a record again in 2016 due to weak carbon sinks. Prof Le Quéré said: “Part of the CO2 emissions is absorbed by the ocean and by trees. With temperatures soaring in 2015 and 2016, less CO2 was absorbed by trees because of the heat and dry conditions. Atmospheric CO2 levels have exceeded 400 parts per million (ppm) and will continue to rise until emissions are cut down to near zero. This is the highest level in at least the last 800,000 years. The estimation of global CO2 emissions and their partitioning among the atmosphere, land and ocean is a major effort by the research community that brings together measurements and compilation of statistical estimates with analysis of model results. Prof Le Quéré stressed the need for reporting such as the Global Carbon Budget to inform decision and actions on how to respond to climate change. Read more of my articles. Kommunikasjonsleder ved Bjerknessenteret med ansvar for eksternt kommunikasjonsarbeid, vår nettside, mediekontakt, møter og samarbeid med andre aktører. Are Olsen (UiB), Abdirahman M. Omar (Uni Research), Jörg Schwinger (Uni Research), Ingunn Skjelvan (Uni Research). The aim of the Bjerknes Centre is to understand and quantify the climate system for the benefit of society.